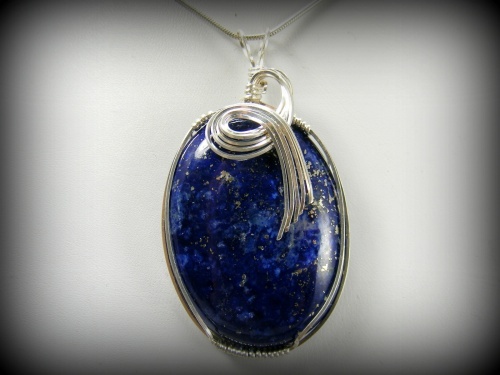 This high fashion designed lapis lazuli stone is so elegant with the deep navy blue color and enhanced with sterling silver sculpted curls to match the flecks in the stone. The stone is said to said to be a proctective stone and opens the third eye. Measures 2 1/4" from top of bail to bottom of pendant and 1 1/4" from side to side. Comes with a sterling silver snake chain.